Like a magnetic picture frame! September's Ivy Kids box (made possible by our Hamilton Schools homeschool partnership!) 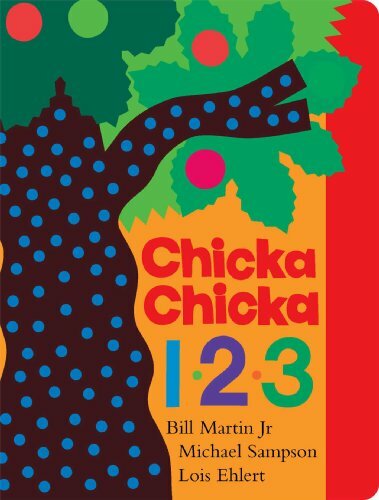 featured Chicka Chicka 123, a book about counting! Perfect since we're deep in number literacy and basic math. Added bonus? The theme was apples and apple trees. Guess which book we've been doing in our regular homeschool studies? How to Make and Apple Pie and See the World (using Five in a Row). What a perfect match! My first surprise in the box: the format sent was a board book. Honestly, I was a bit taken aback. Snooty voice: My kindergartener is so beyond board books. But then I recognized the a. wisdom (not all kiddos on their list are five, almost six) and b. the good fortune (I'm pregnant. I have a toddler. I need more board books.). So a board book, YAY!!! What did our Ivy Kids kit look like? How did we use it? I'll be entirely honest: my initial reaction was, "Huh? A bunch of photocopies and a few random toy-things?" This reaction changed quickly, however, as I figured out how to use the box. I actually spent several days ignoring the box because I didn't want to figure it out. I looked for an "instruction book" like what comes in the amazingly-well-produced Kiwi Crates, and finding none, went to the website. From what I saw I figured I'd have to decipher how to do the crafts and activities based on pictures online. But when I took everything out (finally), I found that each activity came with an instruction sheet. Thank heavens! Even more perfect, the activities ranged from arts and crafts to math or science lessons. So they were a perfect addition to our Morning Time Surprise Boxes. I divided them up with their supplies, putting all the paint crafts in our "Messy" bin, all the hands-on toy-like games in the "Play" bin, the Play-doh in the "Squish" bin and so on. This worked quite well and gave us a break from the MFW (My Father's World) Preschool items I usually have in the bins - which have gotten kinda boring to the littles these days even with all my attempts to keep them fresh. Somebody Loved ALL the Activities! What did we think? Did we love our September Ivy Kids? Loved the book choice!!! I ended up LOVING that the book was a board book. I didn't need to be nearly so careful with it, could let the toddler page through (distraction!) while working with Penny, and I just like board books anyway. I also loved the particular book. It wasn't one we already owned and went along wonderfully with our planned studies. Loved the activities: There was a Huge variety of items, from fine motor skill pincher/puff-balls to painting to math to apple seeds to alphabet recognition. Far far far more than we could do in one or two days. Accepted the quality: Some activities felt ... slight. Like a language arts game printed on very light card stock with perforations that didn't really work well, or weird random dollar store bugs in the plastic apples, or things that looked to be printed on a budget ink-jet. I ended up laminating things or using resources I'd already prepared for FIAR instead (namely the apple life cycle). Not a big fan of: The apple seeds and play doh. The curators of the box clearly don't know that it's unlikely you'll actually grow an apple tree from an apple seed. And the play doh went straight into the trash bin (commercially produced play doh contains wheat). It did inspire me to make up some fresh gluten-free play doh, which I'd been needing to do for a while. So that's a plus. I ended up coloring some bright yellow to match what I'd pitched and putting it in the cleaned-out play doh bucket. Penny was beyond delighted (especially since my homemade stuff smells awesome, thank you essential oils!). Did not like: The September box arrived in early October! This is probably not the fault of Ivy Kids, but more due to the time of year or late ordering. Still, it caused me to have to alter my school schedule. I like my schedules. Altering them... I guess I need the practice! The October box arrived mid-month, which is much better. It's also super cute! I can't wait to share it! Below a few highlights. Just a sprinkling because there were so so so so many more fun things to do! Using apple seeds to make basic mathematical equations. I laminated the sheet for longevity. We learned all about the apple life cycle and the parts of an apple! What kiddo doesn't love to paint?! Minus the mess-potential, I love the time of kid-busy-painting, too. Little brother helped play with play doh and number cookie cutters. Fine motor skills practiced along with counting as we used pinchers to pick apples. I should turn this into a refrigerator magnet! Cute wooden apple with paints. We had fun using stickers to fill in missing letters on an alphabet tree!